Another historical knitting project is in the works. Yes, I’m also still working on the leaf pullover and am almost finished with the back. But rare special requests from wiseNeedle’s technical wizard take priority. 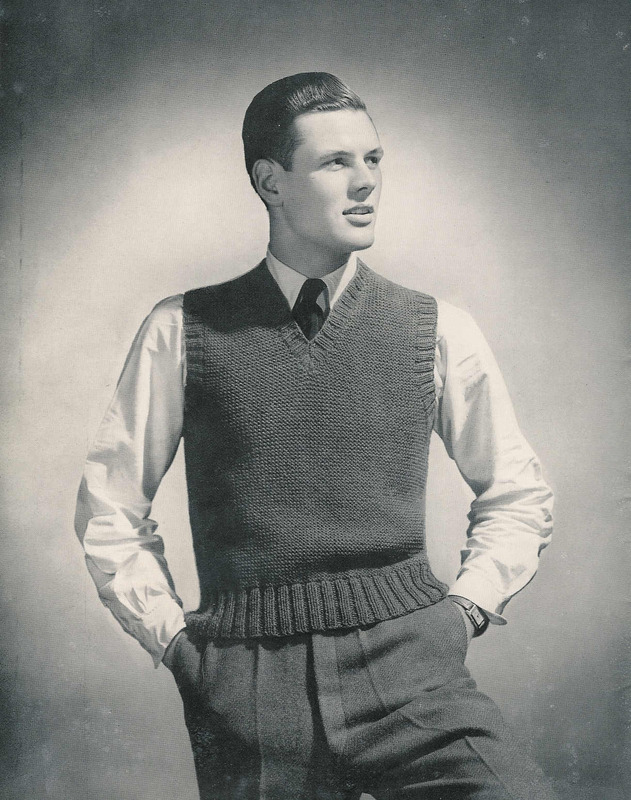 The Resident Male (TRM) has requested a particular vest from the 1941s vintage Minerva troop knitting folio he gave to me for the holiday. This is a very plain garter stitch vest. It has slightly set in armholes, and K2, P2 ribbing. He’d like the V-neck opening to be a bit lower, but other than that, he likes the slim fit and style. Now knitting this ultra simple thing will not be a straightforward as one might think. For starters, the leaflet offers up only size 40, and TRM is a 46. On top of that, the pattern is particularly sketchy, and not in a format used widely today. (More on this tomorrow). I could just look at the picture and then come up with something from scratch, fobbing it off as the real thing, but that wouldn’t be as much fun as trying to redact the original, keeping as close as possible to the 1941 instructions. Let’s begin by looking at the materials specified – Athena Noninflammable Needles size 6 and 7, plus Minerva Quality Knitting Worsted – 6 skeins. I am delighted to report that this pattern DOES include specific gauge – 4.5 stitches = 1 inch, 10 rows = 1 inch. Gauge is not always included in these older patterns, and having it makes a huge difference. The size 6 and 7 needles are about right for the stated gauge and are probably comparable to modern US 6 and 7, but an exact match is irrelevant. I need to use the needles I need to achieve the stated gauge. The sizes suggested in any pattern (not just this historical one) are supposed to be starting points for your own swatching purposes, not absolute dictates. It doesn’t matter a whit if you actually end up using 4s and 6s or 7s and 9s – so long as you achieve the specified gauge, your garment will fit as the pattern author intended. Why “noninflammable” in the name of the needles? Prior to the early 1940s time early pre-plastic needles were either Bakelite or cellulose based. Cellulose needles were easy to ignite and burned quite hotly. The Athenas were probably either Bakelite or a new material (possibly nylon based), that melted rather than ignited when exposed to flame. Now, “Minerva Quality Knitting Worsted – 6 skeins” is a bit more problematic. How much yarn is that? What would be a modern equivalent? How much do I need? From the look of the picture, it’s clear that the yarn is a plain, smooth finish multi-strand yarn. If this pattern was knit in stockinette, I’d guess that it was a heavy worsted yarn, But it’s in garter stitch, which enlarges gauge somewhat, so I suspect that the yarn used is lighter than that, perhaps a true worsted with a native stockinette gauge of 5 stitches per inch. Possibly even a DK, with a native stockinette gauge of 5.5 stitches per inch. (True DK might be pushing it, as I’m not sure I can get 4.5spi with garter in DK without the fabric looking limp and loose). More noodling is needed here. To start, I have a rough idea that a man’s sleeveless vest in size 40 should take approximately 900-1000 yards of worsted weight yarn. I base this on my Nancy’s Knit Knacks yardage estimator card, plus confirmation from Sweater Wizard, and from personal experience. If the original pattern called for 6 skeins, that would mean each skein would be around 150-166 yards. My absolute textbook standards for worsted weight yarns are Brunswick Germantown and Cascade 220. Both clock in at 220 yards per 100g (3.5 oz) or 110 per 50 g (1.75 oz). By contrast, DK weight smooth finish classic Rowan yarns tend to be between 240 and 255 yards for 100g (120 to 127 for 50g). 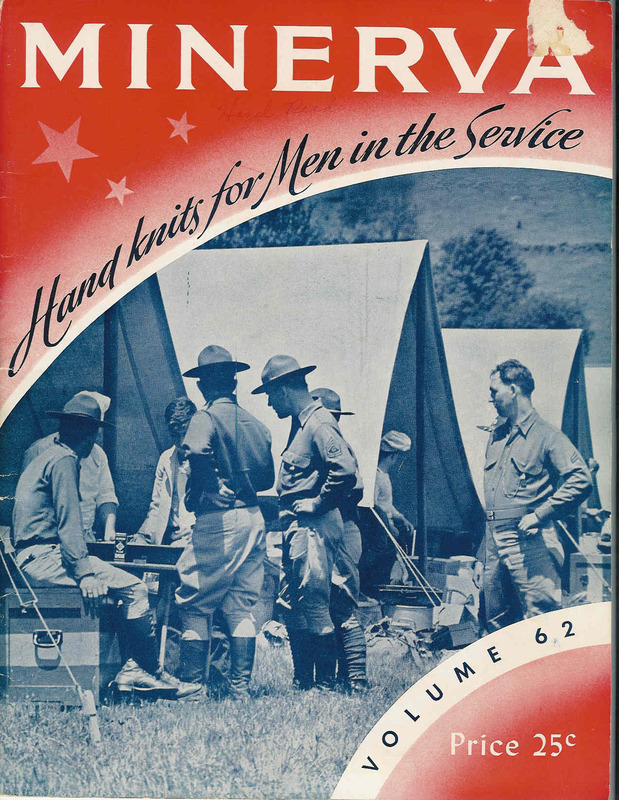 A web search on “Minerva Knitting Worsted” brings up an article on translating a 1934 vintage pattern, which calls out a yardage of 152 yards for 1.75 oz. Now 152 x 6 = 912 yards – within the target range, but 152 yards for 1.75oz (50g) sounds much lighter than worsted. I also find Columbia Minerva worsted on the Vintage Knits yardage chart. There it’s listed at 280 yards for 4 oz. That works out to 245 yards for 100g (3.5 oz), or 122.5 yards for 1.75 oz. Still more than Cascade/Germantown’s 110 and closer to DK than I expected when I started looking. So to sum up my yarn weight findings, I’m now leaning to the light worsted/DK end of available choices, but without truly solid confirmation. Obviously intensive swatching is the next step. I want to make this vest out of stash-aged yarn. I’ve got a couple of choices on hand which I will detail in the next post.